ROYAL Caribbean International, the largest global cruise line, has announced its return to the Gulf in the winter of 2015-16. The fifth seasonal sailings will comprise 16 roundtrip sailings from December 2015 through March 2016, visiting some of the Arabian coast’s most intriguing destinations on a seven-night itinerary. 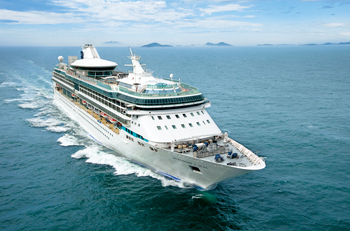 Royal Caribbean International’s Splendour of the Seas is scheduled to dock in its home port of Dubai, UAE followed by calls to Oman’s capital of Muscat and Khasab along with Abu Dhabi in UAE. The Centrum onboard Splendour of the Seas with its sweeping views and central location is a chic and sophisticated venue featuring daytime activities, nightly entertainment and aerial spectacles. There are a variety of restaurants to choose from between fine-dining and casual eateries. There is a special teen-only discotheque to keep younger guests entertained. Splendour of the Seas will add more than 32,000 guests in her first four-month season to the region’s burgeoning cruise sector and the new sailings will be going on sale as of April 10.